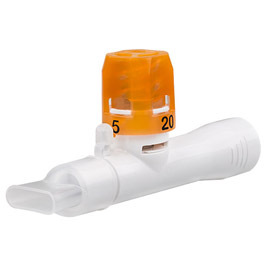 The A-PEP ™ is an accurate, lightweight, and portable PEP therapy system designed to provide positive expiratory pressure therapy as an alternative to pursed lip breathing. The resistance achieved during exhalation is independent of flow an can be set with precision at 5,10,15, or 20 cm H2O, using the control dial. Therapy can be self-administered by the patient.